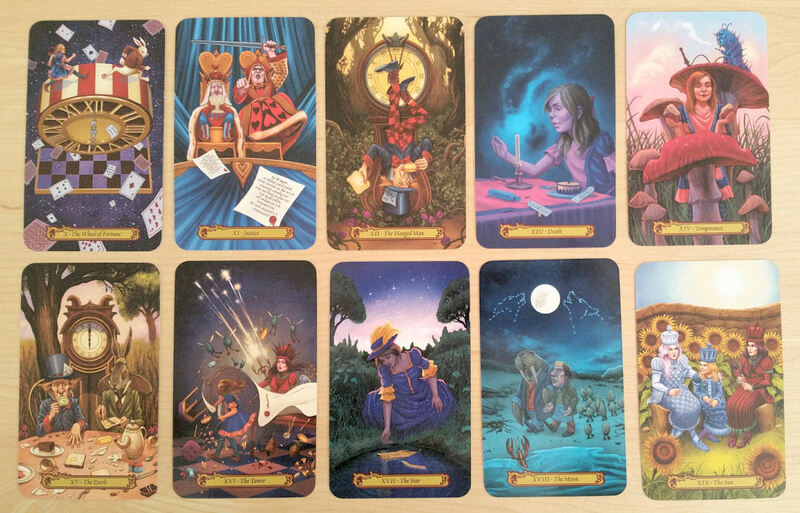 Tarot in Wonderland is a whimsical, playful deck that nudges you to not take yourself or the situation you’re in too seriously, and yet when times have truly gotten rough, it’s going to be there for you to offer insightful advice. It’s that close friend of yours who’s a jokester most of the time and kind of a goof-off but if you’re crying and hurting for real, that friend gets real, too, and is there for you 300%. That’s Tarot in Wonderland. 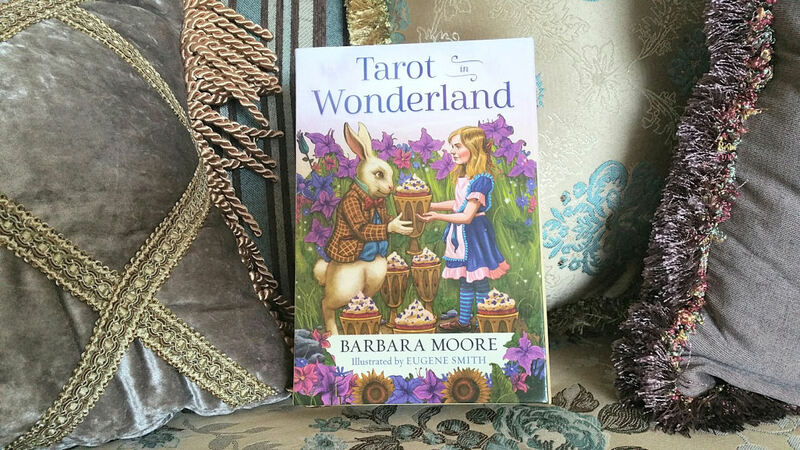 I had the great honor of attending the launch party for Tarot in Wonderland and heard the legendary Barbara Moore speak about her deck. I shared a couple of photos on Instagram if you want to check it out. Now let’s talk about the deck. Thank you to Llewellyn for finally upping their packaging production. The magnetic flap, the hard casing, the cut-out nook for your deck, ribbon, and the book that fits perfectly up top is by leaps and bounds better than what Llewellyn deck packaging used to be. See here, for example, for the Mystical Cats Tarot. or here, near the end, when I again gripe about the product packaging for the Llewellyn Tarot. Barbara dedicated the deck to Hermes, messenger of the gods and the divine trickster. Due to many humorous mishaps along the way, the deck took four years to bring to fruition…probably thanks to Hermes. But it was all worth it in the end because the length of time devoted to this deck means a lot of close attention to detail went into it. Eugene Smith’s art is perfect and truly brings Moore’s vision for the deck to life. I love the inherent madness you see in so many of these cards, how that madness expressed the character of the key it represents, and just the connection to the inner child this deck fosters when you read with it. I love the children’s cartoon and animated fairytale vibes of Smith’s art style here. 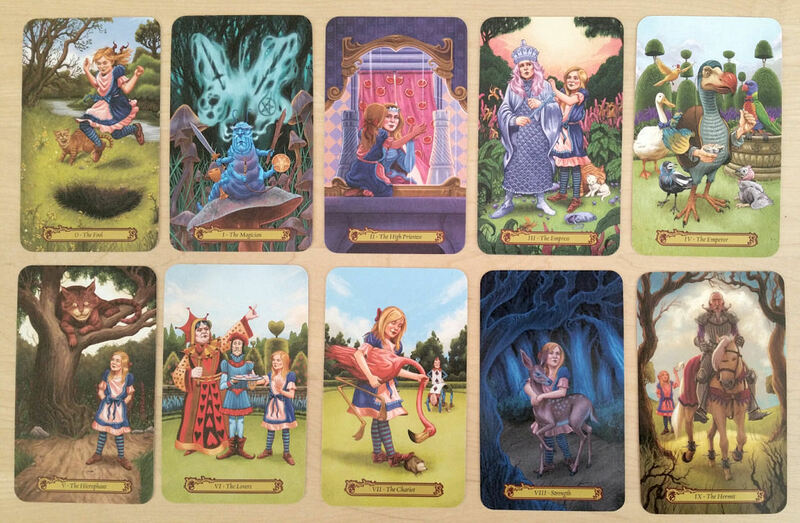 Tarot in Wonderland is truly a deck of playful magic. If you follow the narrative of Alice through the 22 keys of the Majors, Moore has blended the Alice in Wonderland story with the tarot structure so seamlessly you would have simply presumed the two were always meant to be together, born out of the same womb of thought. This is one of those versatile decks for both children and adults alike. If you’re a professional reader asking about tarot decks that’d be suitable for taking to a children’s party, this would be one. As a pro reader, I do like to set aside a couple of go-to decks that I can reach for immediately if I know I’ll be reading for children. And, of course, if you’re an Alice in Wonderland aficionado, then you’re salivating right about now. Could it get any better– one of the biggest names in the tarot world invoking Hermes and engaging in ritual to conceive this tarot deck, illustrated by American illustrator Eugene Smith, who psst… by the way, has this incredible portrait series, “The Secret Lives of U.S. Presidents” that are perfect caricatures. Love his rendering of Howard Taft! 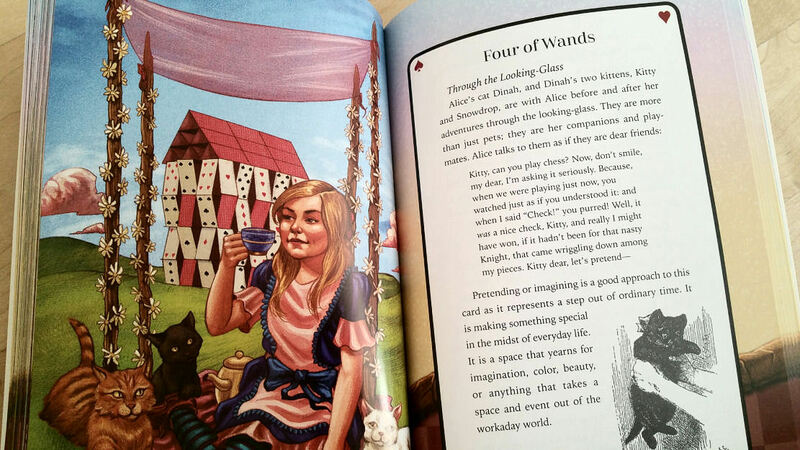 You could not have brought together a better pair for bring an Alice in Wonderland tarot deck to life. Tarot in Wonderland is a deck full of wry humor, mischief, delight, and fantasy, all while operating as a powerful divinatory tool. 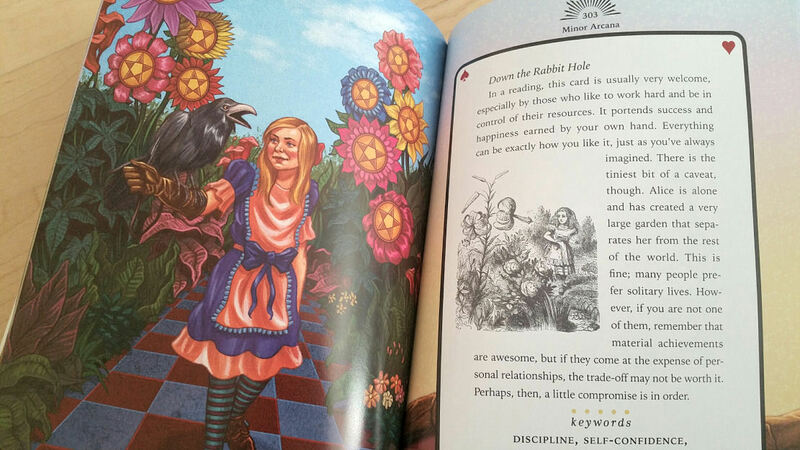 Moore has also done thorough research into the Alice in Wonderland stories and has brought to life many easter eggs, nods to the original stories, deep layering of symbolism, and the companion guidebook contains a treasure trove of nuggets about Alice in Wonderland. Now let’s talk about the guidebook. Wow is this guidebook comprehensive, rendering this deck set perfect for beginners or to gift to someone who’s just learning tarot for the first time. 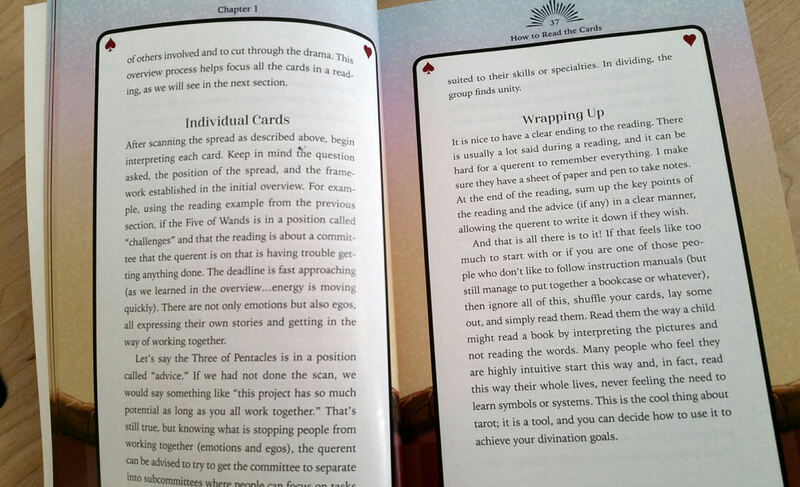 I love that the guidebook is in full color, with glossy pages, and really covers all the fundamentals about reading tarot. It’s a great first deck for any beginner to start learning on. This is one of those tarot deck sets that’s going to be a perfect birthday gift idea for any age. It’s whimsical yet useful, equally playful and serious. 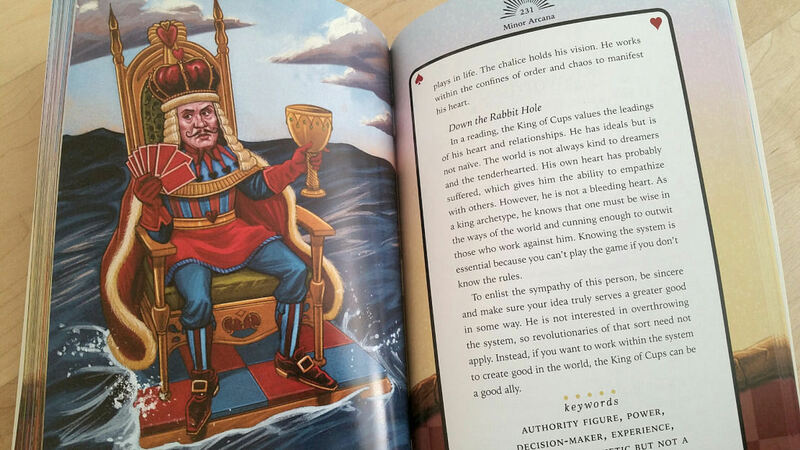 And even if the recipient knows nothing about tarot, the book goes back to basics, so they’ll be covered. 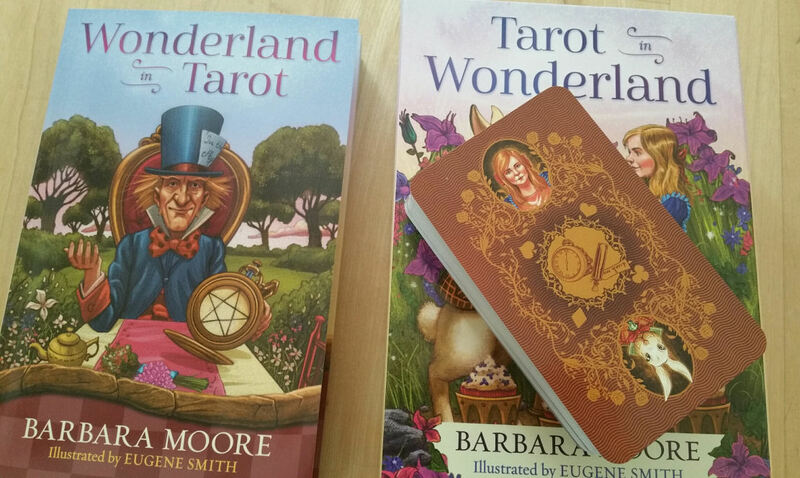 Plus, who better to get tarot card meanings from than the legendary Barbara Moore? 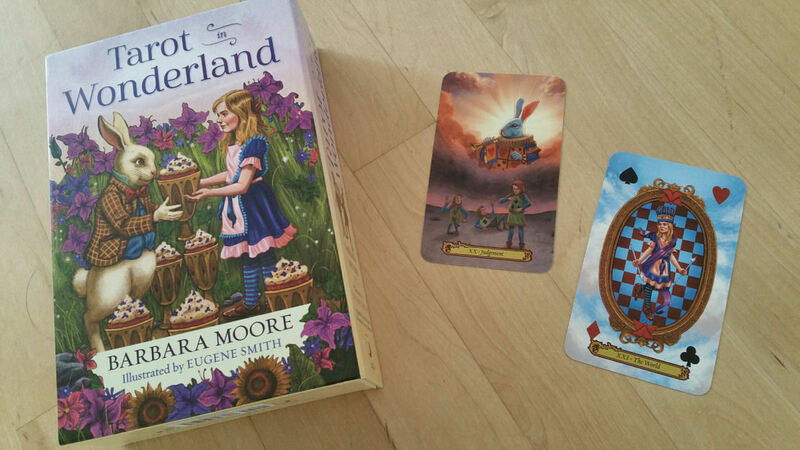 So far of all the Alice in Wonderland themed tarot decks I’ve personally encountered and worked with, Moore’s is my favorite. The mystical legwork that’s been done by Barbara Moore behind the scenes of this deck’s creation compounded with her knowledge of the tarot and clear writing style, the vibrant, inspiring art by Eugene Smith, and then bringing it all together, Llewellyn’s top notch production of the book and deck set culminates into a spectacular addition to anyone’s spiritual toolkit. 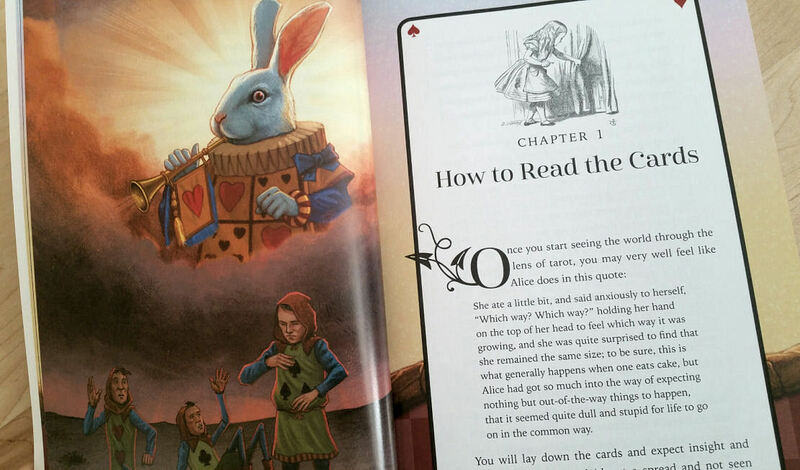 For each card entry, you get a description of what is being depicted on the card from the Alice in Wonderland stories. 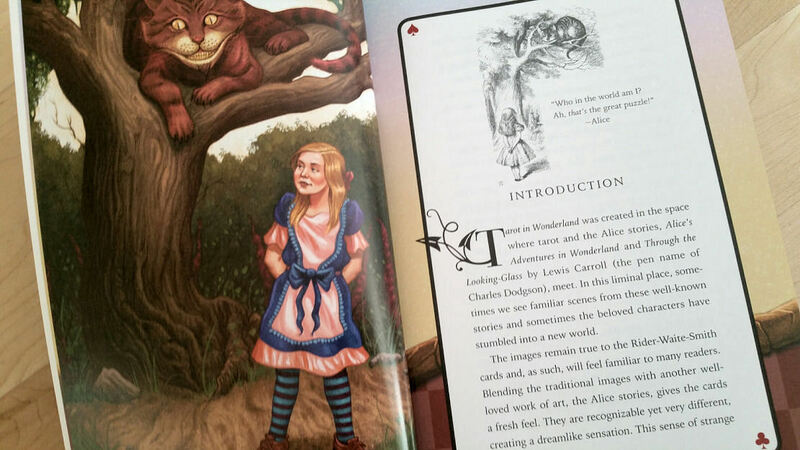 Most of the cards are not depicting actual scenes from the story per se, but do feature the characters in fictionalized or envisioned scenes that they would foreseeably be in beyond Lewis Carroll. The explanations for how to interpret each card are really good here. 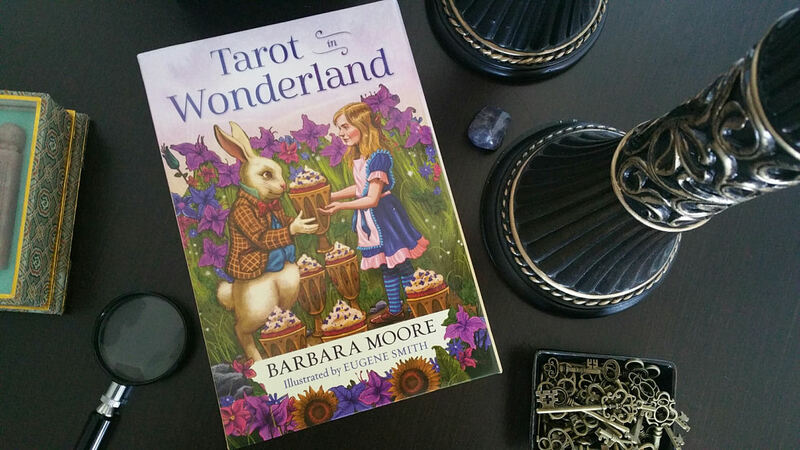 Barbara Moore’s writing on the tarot is, as many of you already know, clear, down-to-earth, practical, and easy to apply to whatever you’ve inquired about. 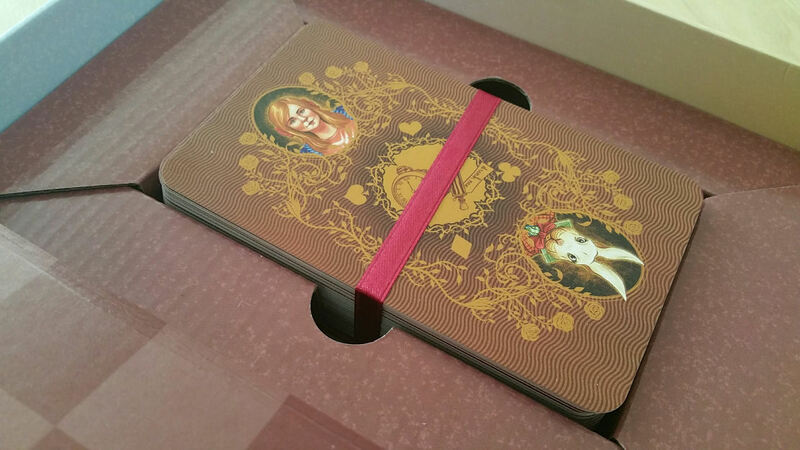 Once you get the deck, you may notice that the height of the nook for the cards is not the same as the height of the deck, so the cards can kind of slide around in the box. Probably not a big deal unless you’re OCD like me. But I have a solution. 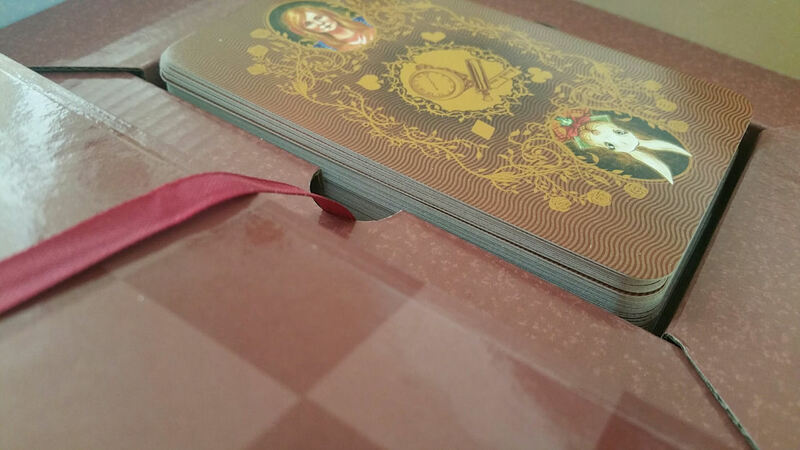 I take the ribbon in the box and wrap it around the cards, then tuck it into the other side of the nook. Keeps the deck snug! Oh by the way, love the card backs. They may not be reversible, in that symmetrical, but you can for sure still read with reversals if you so choose. You’ll just know before you’ve turned over the card whether it’s upright or reverse. I love that, though. I love how there’s Alice on one side and the rabbit on the other. You’ll also see how the two characters are also the ones featured on the box cover. 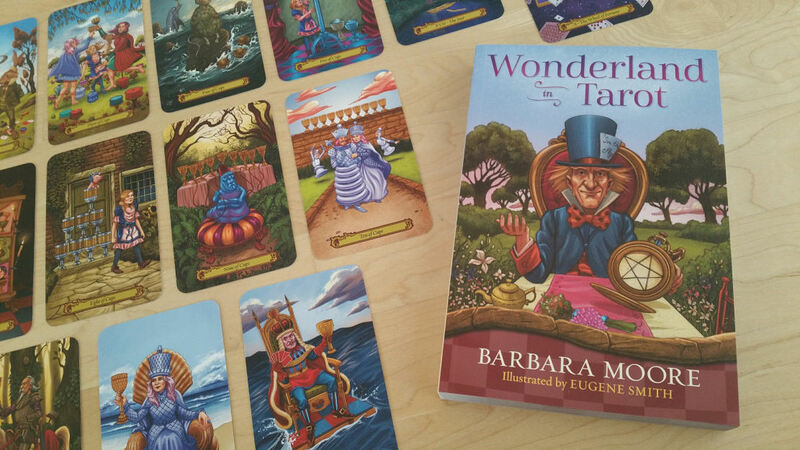 Tarot in Wonderland by Barbara Moore and Eugene Smith is a delightful deck that celebrates your curiosity. 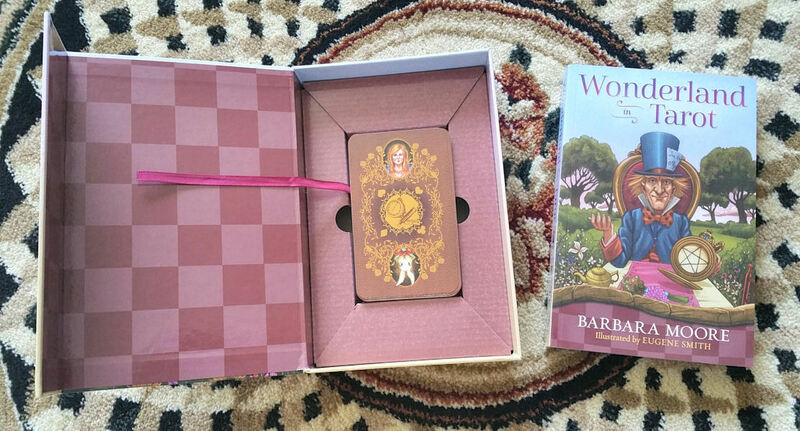 The wisdom and the magic brought together by Lewis Carroll’s beloved story, the luminosity of Barbara Moore, and Eugene Smith’s artistic finesse have conjured a treasure set that every tarot reader, from novice to master, prepubescent to senior, is going to cherish. 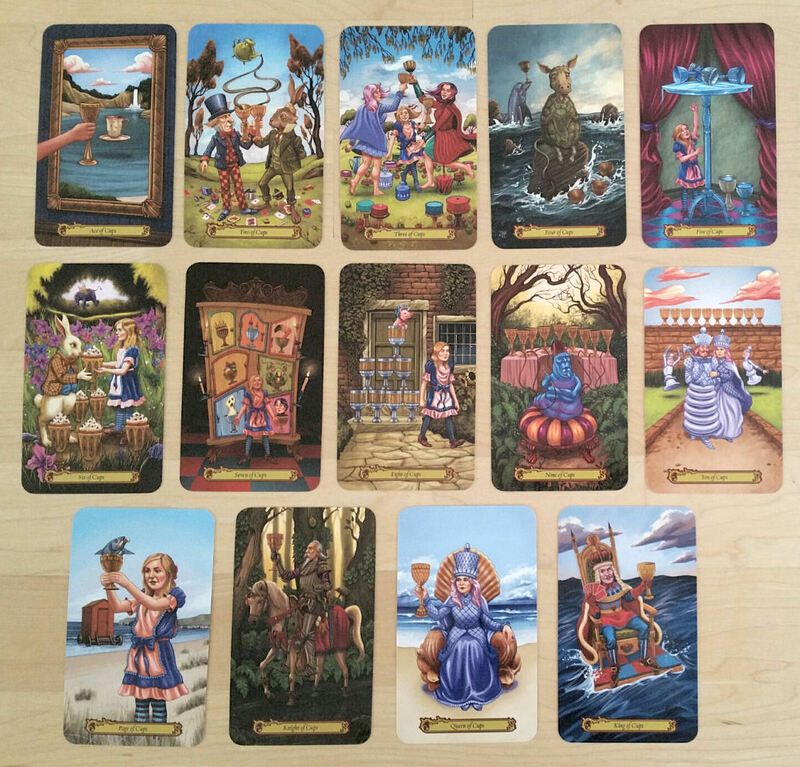 FTC Disclosure: In accordance with Title 16 of the U.S. Code of Federal Regulations Part 255, “Guides Concerning Use of Endorsements and Testimonials in Advertising,” I received Tarot in Wonderland from Llewellyn Books for prospective review. Everything I’ve said here is sincere and accurately reflects my opinion of the deck. Whelp, I’m sold. It looks awesome! So much to LOVE about this and even more to love about Barbara Moore! She was brilliant @Omega, what a brilliant mind in tarot. Great to know she has a brand new deck to share with the all of us. As always a brilliant review, you make it all seem so EASY!!!! 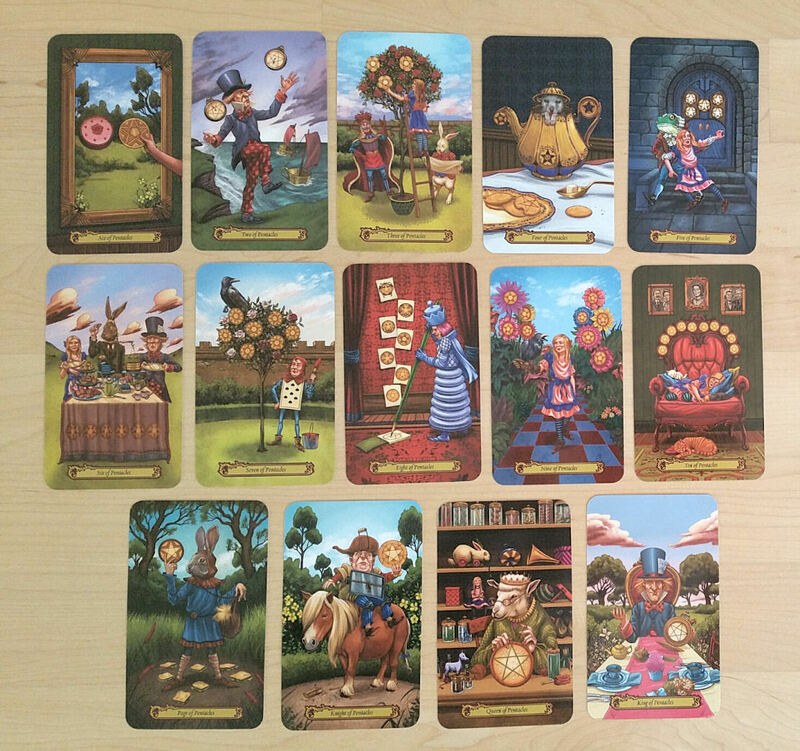 I wonder if you have any precaution you take when reading for children or if you have a special approach when answering children’s questions about tarot. There is a kind a tacit convention when reading for adults; beside the fine print on the business card or the legal disclaimer displayed (or not) somewhere in the tarot reader’s booth or near the table, we expect the adult querent to be responsible for himself and to assume control of his life, taking the messages from the cards (and the reader) as mere suggestions or perhaps eye openers to new opportunities. Even with that presumption, some legislations will make mandatory to put on a disclaimer like “entertainment only” to warn the gullible. Adults are supposed to know what they are in for, and often will ask questions about the tarot in a tongue-in-cheek way (especially in public) and expect that the answer may be given in the same tone (blink blink and the like). Children can be much more direct, frank, and expecting for a straight and honest answer, which would be fine, if you would have the time to give a bit of context in order for them to construct their own opinion, time that we seldom have in a public event. There is also the sensibilities of parents we have to consider, especially in the context of the children party you raised in your article. Even if the responsibility rests mainly on the shoulders of the host who invited a tarot reader, some parent could worry about what you are going to say to their children or can publicly dismiss you and your art quite bluntly, as their own brand of “public interest warning” for the children or the other parents around. I know that because of that, some tarot readers adopted the rule to never read for minors. I wonder what are your ideas about the subject ? P.S. : By the way, I prepared myself with the “Happy Tarot” for those situations. That Moon card with the walrus!! The correspondences really are great. I love how full of small weird details the art is. It reminds me of Jan Svankmajer’s version of Alice, my favorite as a kid and the bane of my mom’s existence.